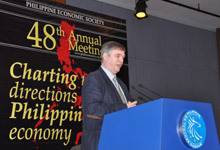 In the hope of putting forward a map with which the Philippine economy may best be steered by the new reform-oriented administration, the Philippine Economic Society (PES), with the support of the Friedrich Naumann Foundation for Liberty (FNF) Philippine Office, held its 48th Annual Meeting last 12 November 2010 at the Bangko Sentral ng Pilipinas (BSP). In his welcoming address, BSP Deputy Governor Diwa Gunigundo said that Filipinos are called to work harder and smarter in the face of uncertainties about global economic and financial recovery. He also underscored the need for credibility. “Credibility enables us to anchor and lead expectations. It is our only true capital in a crisis situation,” said Mr. Gunigundo. He lauded the gathering as timely opportunity for an enriching dialogue on current economic issues, trade and industrial policy strategy. Mr. Jules Maaten, FNF Philippines Country Director, summarized key liberal principles that can catalyze reforms in the Philippine economy into three Rs: responsibility, rule of law, and respect. He said that these promote free competition in the market by operating under a system of transparency and accountability. Mr. Maaten also pointed out that a proactive approach is needed, “Balance of directives and reforms is important, but it is always not necessary to wait for politicians to come with a new idea. People should just do things now,” Mr. Maaten encouraged. He highlighted that the Philippines’ reported growth of 4.6% per year since 2000 despite domestic and external shocks, low investments and net exports, is lower than its Asian neighbors. “However, we can still do much better than this. Our country remains poor despite the wealth of natural and human resources. The government is committed to transformational leadership that is steadfast to poverty reduction and inclusive growth,” announced Dr. Paderanga. NEDA Director-General Dr. Cayetano Paderanga Jr.
Dr. Paderanga further spoke about the two basic blueprints of the governments’s efforts to accomplish aspirations as incorporated in the social contract of P-NOY with the Filipino people, the Medium Term Philippine Development Plan (MTPDP) and the Medium Term Philippines Investment Plan (MTPIP). 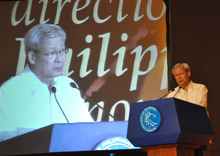 “We envision for the MTPDP to be moored on five pillars of growth: 1) Macroeconomic policy framework and programs to uplift and empower the poor; 2) infrastructure for development; 3) enhancing peace and security; 4) financial sector development and efficient capital mobilization; and 5) protecting the integrity of the environment and natural resources.” He pointed out that these are in programs such as development of an efficient and modern agri sector, Conditional Cash Transfer (CCT) program, establishment of Public-Private Partnership (PPP) infrastructures, approaches for long-lasting resolutions to conflict-ridden areas of Mindanao, enforcing the rule of law to ensure efficient and effective delivery of public service thru greater transparaency, and considering climate change challenges and cross-cutting human rights and gender issues. Dr. Paderanga noted the importance of reforming socio-economic structures that perpetuate economic stagnation and the combined efforts in achieving and sustaining economic growth for Filipinos. PES is a strong network of economists in the academe, government, and business sector. It partners with NGOs, GOs, civic organizations and the media and plays a major role in providing a venue for open and free discussions of a wide range of policy issues, improving the standard of economic research in the country and disseminating new research findings through its conferences, symposia and publication.